The Montpelier Research Database (or the MRD, as it’s known to its friends) contains information on over 35,000 documents and 5,000 objects relevant to the study of Montpelier. Portraits of James and Dolley, all their known letters, letters written by the enslaved, in-house research reports, sideboards that might have belonged to the Madisons, even newspaper clippings about later owner Marion duPont Scott’s horses — it’s all there in the MRD. The MRD was initially developed for the purpose of furnishing the house. Now its role is expanding to support other research projects as well. Just what is it, and how does it work? Curators of historic houses are sometimes lucky enough to have an estate inventory of the resident family’s furnishings. We weren’t quite that lucky, however, when we set out to furnish Montpelier to look as it did during the Madisons’ retirement years. 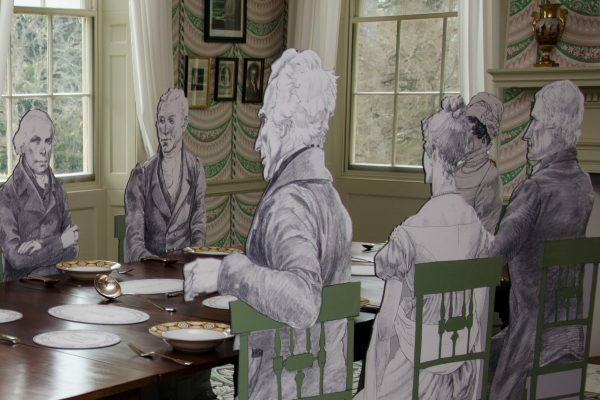 The Curatorial Research team would have to scour the historical record, looking for mentions of furnishings that the Madisons ordered, gifts that they received and displayed in their home, and objects that were passed down with a history of having been at Montpelier. 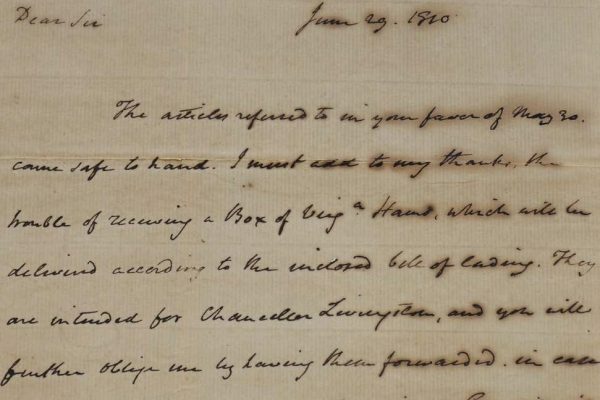 And if that task doesn’t sound daunting enough, consider that the surviving Madison papers – as well as the papers of people who visited and described Montpelier – are in the collections of many different libraries and archives. How would we ever collect and organize that much information? Fortunately, images of many original Madison documents were already online from the Papers of James Madison at the Library of Congress. Several other “Papers” projects were also in the process of publishing transcriptions of relevant documents, including the Papers of James Madison, the Dolley Madison Digital Edition, and Founders Online. In addition to using these resources, our Research staff reached out to all known repositories of Madison materials. Many either shared digital scans of their documents or allowed our staff to photograph them for research purposes. We also reached out to people and organizations who owned objects with a possible connection to the Madisons, and were often able to obtain photographs (and sometimes even borrow the actual objects). At the same time that we were collecting transcriptions of documents, and images of documents and objects, we began to enter them into a specialized database created for us in 2006, which we cleverly named the Montpelier Research Database (MRD). Having a database allowed us to organize the information we collected, making it possible to search for all the references to seating furniture, for example, or all the travelers’ descriptions of the Drawing Room. The MRD uses a version of Filemaker Pro software that was customized for our research needs. It’s a relational database, meaning that it can help us see the relationships among people, places, documents, objects, and concepts. These show up in the MRD as separate modules called Names, Places, Sources, Objects, and Keywords. We’ve created individual records for each person, place, document, object, or concept we want to study. Then the exciting part is to figure out how they’re all connected. If we looked up any of these Name records, we could find out more information and see what else is linked to them. On Mr. Zantzinger’s record, for example, we could read about several men with this last name who might be the merchant that Dolley patronized. There are multiple tabs and sub-tabs on the Source record, where we can attach an image of the document, add a transcription, link to other records, and make notes about what we’ve learned. Here is the sub-tab where we link to the Keywords that describe what’s in the document. (The red X’s show the links to each Keyword.) Then if we wanted to search on the Keyword “Looking Glass or MIrror,” we could find all the documents that mention the Madisons’ looking glasses. This provides useful information for a curator making a Madisonian choice of a looking glass for the Drawing Room. 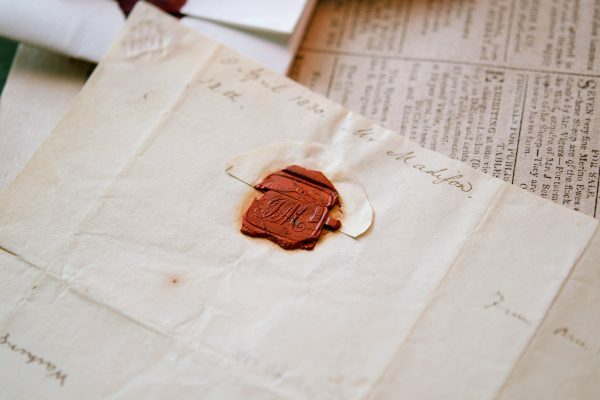 As our research interests expand beyond furnishing the house, we continue to add records for new documents and objects that come to our attention, and to devise additional Keywords to track new topics. When doing our research for the Mere Distinction of Colour exhibition, for example, we realized that adding a Keyword for “Goods Acquisition by Enslaved” would make it easier to retrieve sources that described enslaved people buying items from local merchants. That research would help us debunk the common assumption that the enslaved community depended entirely on the clothing and household goods that the Madisons provided. Thanks to the legwork of previous colleagues who made research trips to numerous repositories, and the notes and links added by past and present researchers, the MRD truly represents the collective knowledge of the Research and Curatorial staff over more than a decade, and offers extensive opportunities for further research. Do you have a research project that would benefit from using the Montpelier Research Database? We’re happy to help! You can email us a query, or arrange to visit us on-site to do your own research in the MRD. 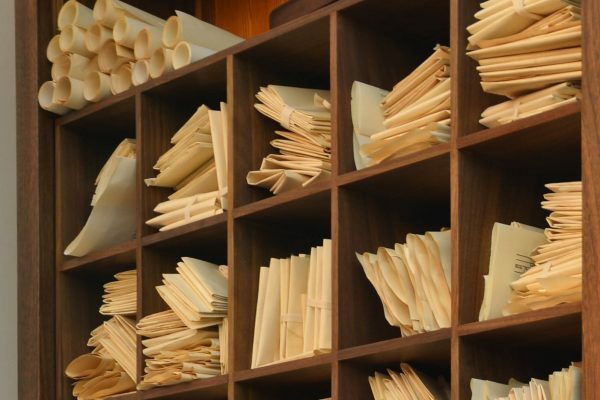 Where Have All the Papers Gone? Follow the paper trail as documents make their way to the archive, the auction house, or the incinerator. The Montpelier Research Database has a place for missing letters … and sometimes they turn up. When a Madison object turns up on Antiques Roadshow, it’s time to do some research. If you guessed Jefferson, Monroe, and Jackson, you wouldn’t be wrong. But there are three others who might surprise you. © 2019 Montpelier's Digital Doorway All Rights Reserved.